I recently got my hands on this old film camera. It is the Pentax Spotmatic F, circa 1973 -76. It’s got a very popular (even today) SMC Takumar 50mm 1.4 lens on it, so I was very excited to use it. When I got home I loaded up some old film I had laying around. After about 3 frames I noticed when I would advance the film forward it wasn’t as smooth as previous frames. I tried again and it was real bumpy ride. So I opened it up and found my film in a bit of a tangle. I figured (and hoped) it must have been user error. The next day I headed down to one of the local camera stores here in Calgary and picked up at roll of Kodak Ektar 100 film for around $11. I very carefully loaded it up and started shooting. A few days (around 5 frames) into the fun time I was having with this beauty, I once again noticed a little ruff film advance. I shot off a quick shot and tried to advance the film again, this time listening carefully and paying close attention. Something was definitely up! I shot the frame (lens cap on, who cares at this point!). This time when I tried to advance the film it was like scraping a rake across a field of big jagged rocks. It’s over, somethings wrong! I opened up the camera to see my film in heaping tangle. To say I was upset was an understatement, ok well maybe not quite an understatement, but I was upset! I said to hell with this camera and I’m done with film! Then a few days later I examine the camera while I tare out the film. I advance the film to see if I can figure out the problem. To my surprise I notice the film take up reel is spinning in the opposite direction I thought it did! WHAT? I quickly try loading the film (film I just took out), this time starting off the reel in the proper direction and quickly shoot off a doozen shots! Not one bump in the road! This entry was posted in Equipment, Random and tagged 100, 1970s, 50mm, 70s, amazing, Asahi, beautiful, beauty, Calgary, camera, cool, ektar, fast, film, funny, hipster, hipster camera, kodak, lens, mistake, old, old school, Pentax, Pentax Spotmatic, Photographer, Photography, prime, Seattle, SMC, story, Takumar, true, Vancouver, vintage, whoops, wicked, yyc. Bookmark the permalink. Ha! My old Yashica Electro GS rangefinder also winds the wrong way. 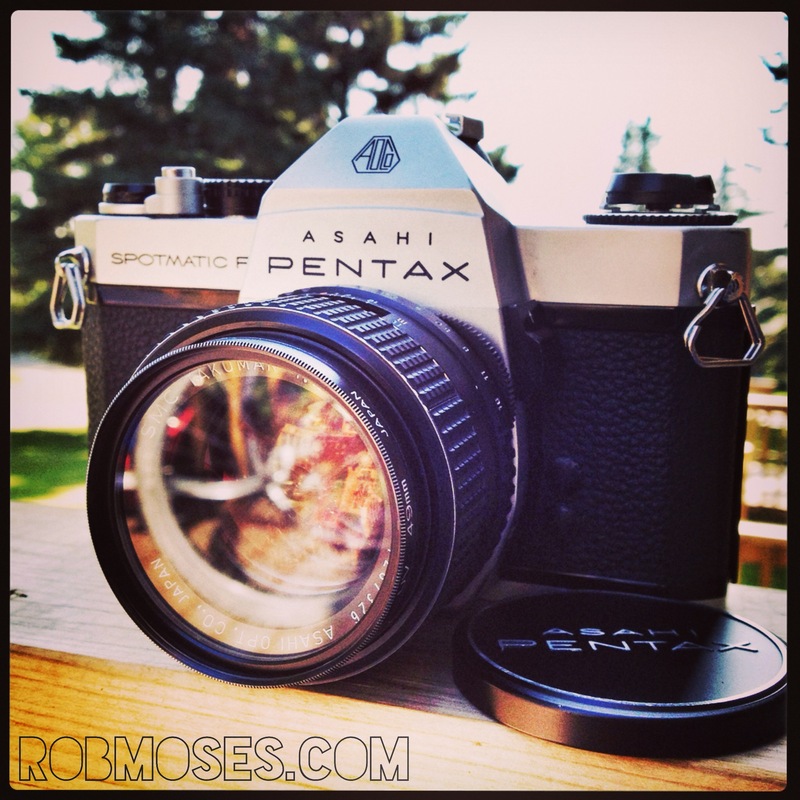 That Spotmatic looks gorgeous, especially with that nice big chunk of glass on the front!